One of joys of writing historical fiction is the researching of it. It was thus that I discovered which 19th C researcher popularized the pie chart. And who was that? While you imagine the “Wait, wait, don’t tell me!” sound effects, and ponder the hint to the left, I give you my friend Monique Doyle’s never-fail pie crust. I haven’t made it yet but have full faith. I botched my mother’s “never fail” but Monique assures me this is a whole other universe and as easy as you know what. add 1 tablespoon apple cider vinegar to 1/3 cup milk. Now the answer . . . Florence Nightingale. She was a mathematician and statistician, taught largely by her father long before she took up nursing. 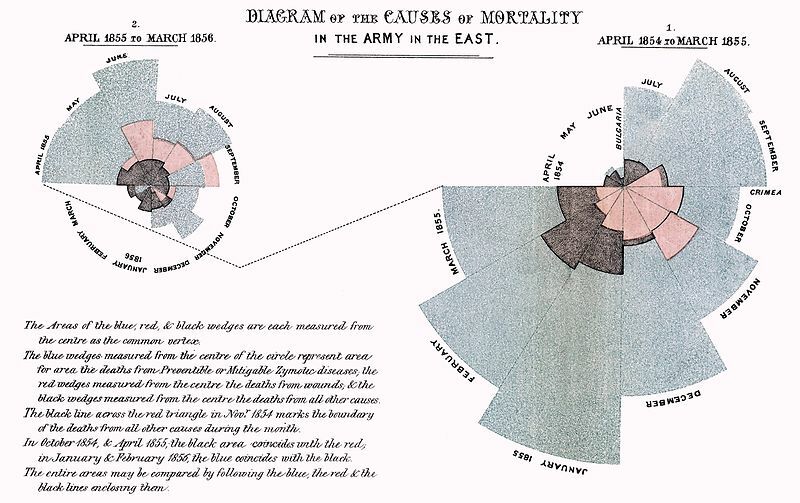 The chart above was part of a convincing array of data which showed that more soldiers were dying in the filthy military hospitals of the Crimean War than on the battlefield. She helped change that. So think of her when you see a pie chart, and of Monique when you next make pie.